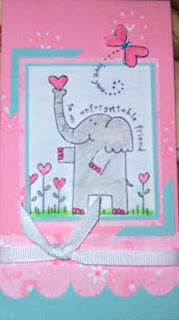 I really like this card although it has a lot of pieces and is time consuming -- but the end result is a cutie! Use layering to mat the elephant picture. Use slit punch to make scalloped edge. Stamp butterfly on scrap, color, cut and adhere with Dimensionals. Stamp floral/heart image in background and use White Gel Pen for accenting them. For more detailed instructions, feel free to contact me!